So you thought oil was big business? Try water. According to the experts, clean water — for drinking, irrigating, manufacturing and myriad other applications — is worth a staggering R3000-billion annually. It doesn't take a rocket scientist to figure out why. Basically, there's just not enough of it to go around. Although most of our planet's surface is covered by H2O, most of it is in the form of seawater, and useless in terms of human survival (that is, if you discount the fish we eat). Freshwater sources such as lakes, rivers, aquifers and dams provide enough water for most of us, but storing, delivering and purifying it costs money — and if we live far from the source, we're talking lots of money. Many socio-political gurus expect water to overhaul oil as the most critical, and certainly the most emotive, commodity before the end of this century. It's even possible that countries will go to war over it. As economies grow, so industry and agriculture will demand a bigger slice of the water pie. The general consensus is that we have about 30 years before population growth and global warming make us nasty. Botswana and Namibia have already squabbled over water rights to Etosha and Okavango , and that's quite close to home. GrahamTek Systems of Somerset West reckon they've got the answer. It's a system called reverse osmosis desalination, and if all goes according to plan, it's about to shake up the desalination industry. Company founder William Graham is so confident about the efficacy, affordability and potential of his patented system that he's posted a bold slogan in his office: "Any water, anywhere, anytime." This company's revolutionary approach to desalination has dramatically reduced the cost, both financial and environmental, to a point where it has become a genuinely practical alternative for thirsty regions such as ours. Its plants are already churning out fresh water at the coast, purifying brackish borehole water in the interior, and filtering out all manner of toxic industrial waste in between. Here's the interesting bit: no chemicals are used in the process. Knowing what he does about desalination, and his company's cost-effective process in particular, Graham is puzzled by the apparent reluctance of municipalities to embrace the technology. "Why not make use of the immense reservoir around us?" he asks. He has a point. The salty sea accounts for about 97 percent of our planet's water and another two percent is locked in ice caps and glaciers, leaving just one percent (fresh water) for the billions of humans and animals who occupy terra firma. Reverse osmosis caught Graham's attention while he was building a desalination plant on the Cape West Coast for what was then the Department of Water Affairs. He developed an interest in membranes, and began to explore ways in which the plants could achieve higher flux rates (fresh water yields). A strong magnetic field was one option, but there was another concept with even more potential. His next question: "Why doesn't the world look at bigger membranes?" It made perfect sense. A bigger membrane (filter) would produce a higher flux, bringing costs down. The conventional membrane diameter was 20cm; Graham ended up designing a 38cm diameter membrane — at that time the biggest in the world. So was born GrahamTek, a South African company with a truly global perspective. But the big membrane is only one component in a system with many variables. Other innovations, including an integrated flow distributor, the use of electromagnetic fields, an energy recovery device and a modular skid platform, contribute to the overall efficiency of the system. Each pressure vessel houses two membranes in series, encapsulating a membrane area of 316m² in total. Their podgy appearance belies the fact that they take up considerably less space than desalination plans of conventional design. In a conventional vessel, you’d need up to seven membranes to achieve an equivalent membrane area. To put the GrahamTek design into perspective, a plant that can produce one million litres of drinking water a day fits into a 6m container. Each membrane is made up specifically to match its raw water source. For example, a synthetic plastic membrane with a pore size of 0.0002 microns is used to process seawater. It takes 46 leaves (individual membrane segments), each 1.4m long, to construct one membrane. Making these leaves is labour-intensive. The feed (raw water) spacer, membrane and permeate (fresh water) spacer are fed through rollers under tension before being folded in half and glued along the sides, making them look like open envelopes. The spacers keep the membranes from collapsing under pressure and blocking the flow of water. The open ends are then glued to the perforated permeate pipe running through the centre of the membrane before being wound around it under pressure and taped securely in place. The end result is something that resembles a very large and very thinly layered Swiss roll. Both the flow distributor (on the inlet side) and anti-telescoping device fitted to the rear are attached before the complete membrane is placed inside its pressure vessel. The anti-telescoping device simply prevents the membrane from popping out of the pressure vessel when water is forced through it at 60 bar. The flow distributor, on the other hand, changes the laminar flow of the feed water under pressure, causing it to become highly turbulent and create micro-bubbles (called cavitation). The feed water is also directed towards the centre of the spirally rolled membrane, where lower velocities are traditionally found. This is achieved by placing many small-angled inlet holes, positioned in concentric circle, on the flow distributor's surface. These micro-bubbles actively scour the membranes to prevent fouling, and increase membrane flux by carrying away ions (salt molecules and so on) from the membrane’s surface more rapidly. The result is a lower osmotic pressure at the membrane surface, allowing a greater permeate flux with less pressure. There is another advantage to this system: intervals between maintenance backwashes are lengthened, which translates to 60 per cent less backwashing than in conventional plants. An electromagnetic device virtually eliminates fouling from the equation, dramatically increasing the life of the membranes. The principle is simple and effective: a conductor is wound into the pressure vessel at strategic points to establish an electromagnetic field, which is then tweaked (by controlling the electric current) for optimum effect. The calibrated harmonic field effectively disorientates the steric formation of active crystal growth by separating the chemical bonds. Organic foulants are affected in such a way that normal attraction to the charged membrane surface is diminished to the point that fouling simply doesn’t occur. So efficient is the system that plants have been known to operate for more than a year without the membranes needing cleaning. The big plus here is that the need for chemicals is eliminated, both in the pre- and post-treatment phases, contributing further to lower operation costs. Two energy recovery devices are available, depending on the size of the plant. Whereas both fulfil the same function, the pelkon wheel design (the older and noisier of the two) is best suited to smaller units. Connected to the brine (concentrated saltwater effluent) outlet, and in turn attached to the high-pressure pump shaft, it reduces the power requirement to between 2.0 and 2.9 kilowatts per hour for every 1000 litres of water produced. That’s a power saving of about 37 percent. Alternatively, it can be connected to a generator to supply about 50 homes with electricity. According to Graham , their newer pressure exchanger reduces power consumption even more – by an impressive 42 percent. Up to nine pressure vessels, producing 1 million litres a day, can be mounted on to a single pre-assembled, fully operational skid platform. The modular design allows them to be linked together to provide plants of varying capacities. Need another million litres? Just add another skid – it’s as simple as that. “We have the capability to build plants that produce 160 megalitres a day,” says Jean Vos , a spokesman for Ocean Mineral Water, GrahamTek’s sales division. Not surprisingly, it took serious capital to develop this system, which explains why Graham left South Africa for, um, greener pastures about 10 years ago. His destination was the Middle East , a part of the world where water is really valued. After proving his technology worldwide, he returned home and set up shop in Somerset West, where his company now manufactures all components on site. GrahamTek is one of about five membrane manufacturers in the world, and the only one in Africa . When setting up a desalination plant, the first consideration is the water source (no surprise there). If it’s seawater, says Graham , a beach well is preferred because it works much like a giant swimming pool filter, removing the need for pre-filtration at the plant. This method also costs less than it would to lay pipelines out to sea. The next best thing is a tidal pool, from where the seawater is fed through a sand filter. A bag filter then removes any remaining debris to get the silt density index (SDI) of the seawater to below 3 and ready for processing. When an open sea intake is the only option, GrahamTek’s micro-filtration process really does its job, even removing bacteria and e.coli. A feeder pump primes the pressurised turbine pump and ensures its bearings are lubricated. Capable of producing pressures of up to 60 bar, it forces the water into the pressure vessels – connected in parallel – through the membrane, allowing only the water molecules to pass through and trapping all the attached salts. As South African seawater has an ionic constituency of 34 000 TDS (total dissolved solids), it needs to pass through the system only once at 58 bar to reach an acceptable TDS level of 300. The recovery rate of drinking water from seawater is about 45 percent, and with brackish water about 80 per cent. The brine (reject water) then passes the energy recovery device before being pumped harmlessly back into the sea. 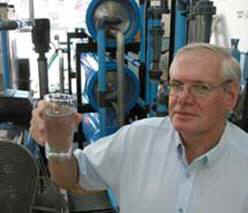 In 1995, fresh water derived from seawater by reverse osmosis cost R18.50 a kilolitre. GrahamTek now produces it for R4.85 a kilolitre (off a 5 megalitre per day plant). At R2.50 a kilolitre, brackish water costs even less to process. This is an all-in figure, including the recouping of costs, maintenance, electricity and even staff salaries. All of which sounds like good news for housing developers and golfing estates that invariably pay hefty bulk tariffs to municipalities. On a smaller scale, the “Aquadelfi” unit is aimed at farmers. Producing up to 25 500 litres a day, it can treat a wide range of brackish waters. It’s a so-called “plug-‘n-play” unit, so all you need do is load one on to your bakkie, drive home and connect the pipes. Smaller still is the “Seawater Aquadelfi”, designed for more modest applications such as holiday homes at the coast or seagoing boats, and capable of producing 2 000 litres a day. Water, water, everywhere. And you can drink it. For more information, contact Ocean Mineral Water on 021-854 7676.